Sometimes, when I read a book, I’m reminded of how powerful words can be. How, with some simple sentences, we can be able to feel everything. Words can make us feel stronger, or break us down completely. I’m absolutely convinced that Jandy Nelson mastered the art of words. She manipulates them like brushes on a blank canva, and draws us a masterpiece. THE PUZZLE OF A LOST RELATIONSHIP. I have no twin, but I have a sister I’m very close to, so I can safely say that I’ll Give You The Sun completely echoes with me. Jude and Noah used to be close, so close, the kind of twins that can communicate with their minds and separate the world in two, just for the two of them. Told in a dual perspective, we can perfectly grasp the differences between the twins, yet all the places where they meet, or, where they should be meeting. Right from the first pages, we’re immersed into Noah’s perspective of the world, at thirteen years-old. He’s still young, yet the world he paints us in a few pages is completely is own, and we can already see the overwhelming presence of art in his life, both in the characters’ mind, and in the author’s writing. Noah’s shy, he’s awkward, he quite doesn’t fit in, especially at first, yet this boy grows on you from the first pages. Then, after the first part, we’re thrown off in a different world. Jude’s world, at sixteen years old. In between, there’s a gap, a weird, strange period of time where we’re just left wondering, WHAT DID HAPPEN THERE. The whole book is structured in this going back-and-forth, between past and present, with this overwhelming, tempting yet scary gap between the two parts. TWO TWINS…YET TWO DIFFERENT VOICES. Writing from a dual perspective is a struggle, sometimes, both for the writer and the reader. How can we identify, how can we, reader, be able to love and cherish both characters equally? How can the writer manage to create two very, distinctive, different voices, yet give them the same weight in the story? I’m thrilled to say – and still a little overwhelmed -, that Jandy Nelson managed to do that, perfectly. I’ve read that some people didn’t like Jude that much, and I can understand. But, personally, I found that the author created two distinctive, great, strong voices, with their own personalities, their own background, and their own ways of thinking, even despite the fact that those two characters almost spent their whole lives together. Both Noah and Jude are three-dimensionnal, both of them have their word to say, and I loved hearing it. They felt so real I wanted to take their hands. WARNING: THIS BOOK WILL MAKE YOU FEEL THINGS. I’ll Give You the Sun is a story about grief, about forgiveness, about coming to terms with who you are, what you really want to be. As I read, I was trying to put together the puzzle of the relationship between the twins. WHY aren’t they being so cute together anymore? Just, WHY?! But, as I was reading, I got lost. Into the writing, into the story, but, most of all, into the characters’ lives. Both, especially Jude, are going through an amazing character development. Told in excellent writing, that I could sip like I sip tea -which means, almost ALL the time- I’ll Give You the Sun made me go on a roller-coaster of emotions, I’m still not sure I’m over it. A little dizzy, with a laugh beginning on my lips and a warm feeling in my stomach, I‘ll Give You the Sun gave me all the feelings a great contemporary book is supposed to give you. And even more. I want to read all the gorgeous quotes and plaster them all over my walls, just to never forget how a book can be beautiful and make you see the world like it’s art, too. Reading this book reminded me of the very famous quote in Rainbow Rowell’s book, Eleanor & Park. “Eleanor was right. She never looked nice. She looked like art, and art wasn’t supposed to look nice; it was supposed to make you feel something.” Well, let me tell you. This book is beautiful, and it will make you feel everything. Go read it. 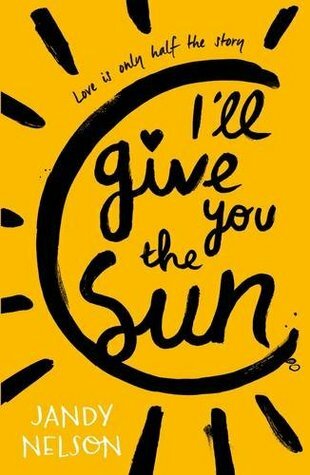 Jandy Nelson, I’ll Give You The Sun, Published by Walker Books, April 2nd 2015 (first published September 16th 2014). Jude and her twin brother, Noah, are incredibly close. At thirteen, isolated Noah draws constantly and is falling in love with the D dimensioncharismatic boy next door, while daredevil Jude cliff-dives and wears red-red lipstick and does the talking for both of them. But three years later, Jude and Noah are barely speaking. Something has happened to wreck the twins in different and dramatic ways . . . until Jude meets a cocky, broken, beautiful boy, as well as someone else—an even more unpredictable new force in her life. The early years are Noah’s story to tell. The later years are Jude’s. What the twins don’t realize is that they each have only half the story, and if they could just find their way back to one another, they’d have a chance to remake their world. This radiant novel from the acclaimed, award-winning author ofThe Sky Is Everywhere will leave you breathless and teary and laughing—often all at once. This book has been on my TBR for so long now. I really need to get to it … but we have our common problem. WHEN?! WHEN?! That is the question I’ll never be able to answer to. But put this one VERY HIGH on your TBR, you won’t regret it, I promise. It’s just too pretty for words. I LOVE this book! I so glad you enjoyed it. It was just perfect. Have you read The Sky Is Everywhere? That one’s amazing too. Jandy Nelson knows how to make you have allll of the feelings. I loved this book so, so much when I read it last year. I completely agree with everything you’ve said! I think it’s an absolutely beautiful book, and I loved the style. The characters were perfect, and I just loved every aspect! Aaaahhh what a lovely review, Marie!!! 😘 You’ve made me so much the more excited to read this book, which is saying something seeing how I’ve been absolutely CLAMORING to read this book ever since I heard of it. ❤️ It sounds amazing! Can’t wait to read it! This is such a wonderful book review! This book is one of my favorites of all time, and you really captured everything I love about it. Jandy Nelson is a master at writing beautifully and crafting realistic characters — she uses with so much power and brilliance. Have you read her other book, The Sky is Everywhere? No I didn’t, ahah, but I will put it VERY HIGH on my TBR, I’m sure I will love it, too! ❤ Thank you! Oh noo, it’s not, at all! I tend to take it personally, too, when someone says they don’t like a book I completely LOVED. It’s hard when someone criticize a book I loved, ahah, it’s so, sooo hard. This book has been sitting on my shelf, looking at me, judging me, basically screaming READ ME! Haha and I’m getting aroud to it soon, plus your review made me more excited about it so thank you ! I couldn’t agree more with you on how you see this book! It does deal with a lot of important and deep topics of siblings, identity creation, and definition. I love the two voices! I thought that Jude was nuts but I think that we all look for stuff to believe in to help us survive life. I like how this book depicted love so purely and so colorfully! I made me fall in love all over again!